What is a Polymer Chain? 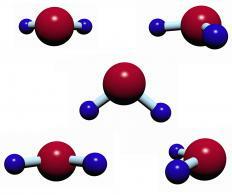 Water molecules will not form a polymer chain. Polymer chains are large molecules, or macromolecules, made up of many monomers that are joined together. A monomer is a single unit of a molecule, for example, amino acids and nucleotides. Mono means one and poly means many, which means there are many monomers in a chain. To make a polymer chain, or polymer, the monomers that are joined together can be identical or similar. When the term poly is used to describe a polymer chain, it is referring to a very large number of monomers. There can be thousands or even millions of monomers in a single polymer. Not all molecules can bond together to form chains. Water is one example of a monomer that does not bond together to form a chain, even when there are many water molecules. A number of different characteristics of a polymer chain determine the polymer's behavior as a molecule and also how it interacts with other molecules. The first characteristic used to group chains is the type of monomers that form the backbone of the polymer. If a polymer chain is made up of only one type of repeating monomer, it is referred to as a homopolymer and if it contains different subunits, it’s called a copolymer. The name of each chain is often derived from the monomer backbone, for example, DNA is a polynucleotide. When polymers are formed, they can have a linear backbone or a branched backbone. Linear chains have the simplest structure, as they are just made up of a long chain of monomers joined together without any branches. A ring polymer is a special type of linear polymer, where the backbone has no branches but forms a ring instead of having a discrete start and end. Branched chains have a backbone with side chains branching off of it. These types of polymer chains can be quite complex and include structures such as ladders, dendrons and star polymers. The length of the backbone is an integral characteristic that determines the physical properties of a polymer chain. The length, or number of monomers, affects a number of different physical properties of the polymer. As the chain length increases, melting and boiling temperatures increase, viscosity is increased and mobility decreases. There is also a higher likelihood of interactions within molecules of the chain as it increases in length. These changes result in a chain that is stronger, less likely to deform or break apart and more able to hold its position. What are the Best Tips for Epoxy Mixing? What are the Different Polymer Chemist Jobs?